We are leading Manufacturer of RTD for Acids and Alkalies-Teflon Coated and our product is made up of good quality. This range of RTD is designed to measure temperatures of the highly corrosive acids and alkalis. This RTD It is capable of measuring temperatures upto 2000C. They are supplied with SS316 / SS316L Teflon coated sheath with a plastic terminal head. Teflon ( PTFE) coated sheath make the RTD corrosion and heat resistant protecting the sheath from exposure to acids and alkalis. Angular assemblies are available on request. Angular assemblies make enable the RTD to be installed in complex positions. 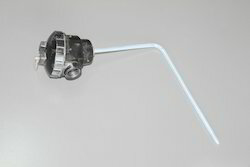 Terminal heads are available in plastic, polypropylene (PP) heads on request. We are leading Manufacturer of RTD Sensor for Acids and Alkaliand our product is made up of good quality. The RTD is capable of measuring temperatures upto 2000C. Supplied with titanium sheath with a plastic terminal head. Titanium sheath makes the RTD corrosion and heat resistant protecting the element from exposure to acids and alkalis. Angular assemblies are available on request. Angular assemblies enable the RTD to be installed in complex positions. Its 3-wire Pt100 RTD element can be constructed in single or dual assembly in Class B as per the IEC 751 standard for RTD sensors. Terminal heads are available in polypropylene (PP), plastic heads on request. SS316 Mineral Insulated RTD with comes with a teflon sleeve which protects the sheath from corrosion in highly concentrated acids and alkalies.The assembly is made of bendable and insulated sheath using a flexible sleeve, making it suitable for complex mounting requirements. The RTD terminal heads are supplied in plastic material as standard. Stainless steel and polypropylene (PP) terminal heads are also available. 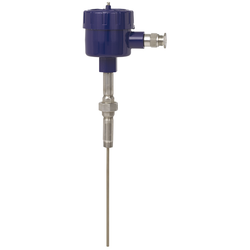 Our Acid and Alkali RTD sensors are specially designed to withstand corrosive environments. The various options available to our customers include non-reactive teflon coating, corrosion resistant titanium sheaths, flexible cables and protective teflon sleeves amongst others, which allow for complex installations. 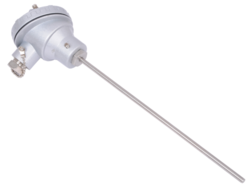 All our sensors are 3-wire Pt100 element in simplex or duplex assembly, built to measure temperatures upto 200 DegreeC. Looking for Acid and Alkali RTD ?